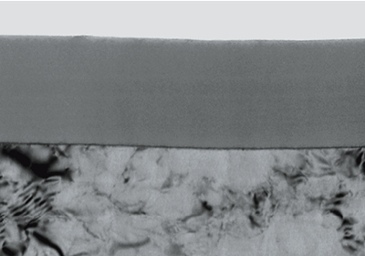 In 1989 considerably reduced compression, smoother section surfaces and improved structural preservation thanks to the use of our ultra 35° knives was demonstrated (J. C. Jésior, Scanning Microscopy Supplement 3, pp. 17 – 153, 1998). In the meantime, a large number of researchers have recognized the advantages of 35° knives, in particular for sectioning biological specimens of all kind, non-homogenous specimens, non decalcified bone, dental material, etc. The ultra 35° knives are perfect for sectioning relatively soft materials research specimens including metals and polymers, as well as mixed specimens such as polymers filled with nanoparticles, brittle materials such as catalysts, crystals, semiconductors, etc (G. Mahon et al., Microscopy Research and Technique, Vol. 31, pp. 267 – 274, 1995, S. R. Glanvill, Microscopy Research and Technique, Vol. 31, pp. 275 – 284, 1995, P. Swab et al., Mat. Res. Soc. Symp. Proc. Vol. 115, pp. 229 – 234, 1989, P. Schubert-Bischoff et al., Microscopy and Microanalysis, proceedings, page 359, 1997). 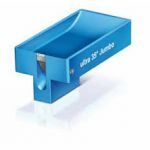 The ultra 35° knife has demonstrated it’s usfulness as a standard knife for the majority of applications in both biological and materials research. 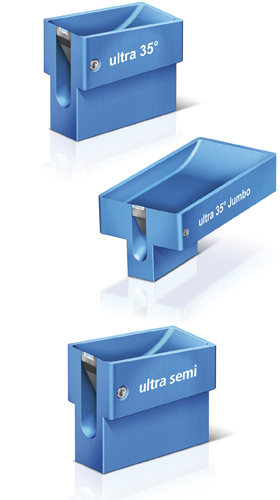 The ultra semi knife serves for alternating sectioning ultrathin/semithin, for rather thick sections (for exemple 200-300nm 3D reconstruction, etc. EM micrograph of an ultramicrotomed section of the anodic alumina film formed on Al-2 wt%Cu alloy. Xiarong Zhou, School of Materials, University of Manchester.